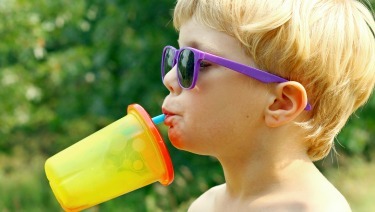 Healthy Children > Tips & Tools > Ask the Pediatrician > My preschooler refuses to drink milk. What should we do? My preschooler refuses to drink milk. What should we do? ​While milk can be nutritious, it isn't absolutely necessary for a healthy diet. Milk has protein and calcium and is fortified with vitamin D. Other dairy products, such as cheese and yogurt, can provide the same nutrients, as can "alterna-milks" such as soy milk or almond milk, although you should talk to pediatrician before you switch to one of those. If your child doesn't like dairy products or alterna-milks, he or she can get protein from meats, fish, eggs, soy beans, and other beans. Fish with bones, such as salmon, sardines or herring, have calcium, as does broccoli. Vitamin D is made naturally by the body in response to sun exposure (a healthy amount—check with your pediatrician) and supplements can also be helpful. So—don't panic. With a bit of creativity, your child will be fine. ​Claire McCarthy, MD, FAAP is a primary care pediatrician at Boston Children's Hospital, an Assistant Professor of Pediatrics at Harvard Medical School, a senior editor for Harvard Health Publications, and an official spokesperson for the American Academy of Pediatrics. She also writes about health and parenting for the Harvard Health Blog and Huffington Post.